Do you want to be a part of a group of exceptional people working together to raise the confidence in children of all ages and abilities? If you answered YES! and are reliable, energetic, have a love for working with children and basic knowledge of our sports… please fill out an online application and we will be in touch. Do you love to teach the joys of movement? We are looking for excellent people to teach beginner gymnastics. 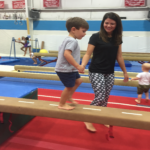 Classes include Tumbleweeds ages 3-5 as well as school aged beginners and Red Team. Hours could include weekday afternoons/evenings as well as Saturday mornings. Extensive training is provided. Do you love the water? 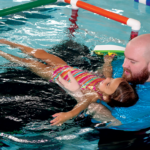 The area’s only swim school is looking for excellent people to teach Levels 1-6 in our warm water environment. Hours could include weekday afternoons/evenings as well as Saturday mornings. Extensive training is provided.